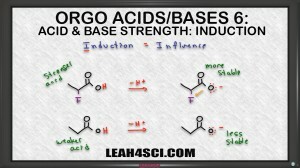 The inductive effect is likely the most tricky when it comes to ranking acids and bases in organic chemistry. In this video I show you how to view atoms as ‘cheerleaders’. This will help you get a better understanding of the concept and help you rank acids and bases. Basicity is the opposite of acidity. So just flip the rules. You are absolutely amazing and truly a God sent blessing! Thank you for these amazing videos!